Over/Under: Over 168.0 at 1.90 Bet Now! The first Euroleague game of the week is a clash between two sides that are at the opposite ends of the table. Both of these teams can have their Euroleague Playoff hopes decided by the end of the week if results go in their favour so you have a situation where both teams will be desperate for a victory. The need to win is more desperate for the side at the bottom of the table but of course, the team at the top, who are also the home side, have a lot more in their favour. CSKA Moscow grabbed a win in Barcelona last week and coupled with Real Madrid’s loss, the reigning European champions moved to the same record as the group leaders. The 18-6 record that Moscow and Madrid share sees them sitting pretty for the playoffs and if CSKA Moscow wins this game, they will be guaranteed a place in the playoff spot. 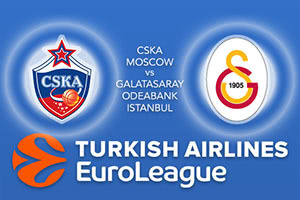 The schedule of the fixtures means that CSKA can be the first team to bag their spot in the next round of the Euroleague. If CSKA lose this game, but Darussafaka Dogus Istanbul loses on Friday, the Russians will still qualify for the Playoffs this week. For Galatasaray, their Playoff dreams can be officially extinguished this week if they lose and Baskonia Vitoria Gasteiz wins later on Thursday evening. It is not as if the Turkish side have been harbouring serious Playoff ambitions in the past few weeks but while it is still mathematically possible, it is something worth aiming for. These sides have met five times in Euroleague action and CSKA have won four out of the five, including an 84-109 triumph earlier on in the season. Nando De Colo grabbed 22 points and Milos Teodosic provided 20 points and 11 assists for a stunning double-double. For the Turkish side, Sinan Guler has had a strong season and he has provided an average of 11 points per game this campaign while Vladimir Micov has chipped in with an average of 10.8 points per game. The hosts should be fired up to clinch their Playoff spot so back CSKA Moscow to win by -18.5 which is available at odds of 1.90. With the Over/Under market in this game, go OVER 168.0 at odds of 1.90. Bet Now!